When is the San Francisco Pride Parade? The 2013 San Francisco Pride Parade takes place on Sunday, June 30. Do I have to identify as gay, lesbian, bisexual, or transgender to march in the parade? Not at all! As in previous years, the Bay Area Intactivists contingent will be extremely diverse. Do I need to register to march with Bay Area Intactivists? No, but if you have a Facebook account we would love it if you'd click “Attending” on this event so that we have a rough idea of how many people to expect. Absolutely! We welcome intactivists of all ages to join us. Wear shoes comfortable for walking. A hat and sunglasses are great for protection from the sun. If you have an intactivist shirt, please wear it! If you would like to purchase a shirt for the parade, you can do so from our store. Drinking water (in a plastic or metal container) and sunscreen are recommended. There is often a long wait in the parade contingent queue area so bringing food or snacks is also a good idea. If you are bringing children, consider bringing small games or other activities to keep them entertained while we wait for our turn to march. Keep in mind that anything you bring will have to be carried or pulled down Market Street. Are wagons, strollers, or bikes allowed in the parade? Yes! We especially love seeing them outfitted with intactivist signs or other decorations. The parade route is approximately 1.3 miles. The march itself takes about 30 minutes but our contingent must first wait for a few hours in the queue area for our turn to march. How long will we wait in the contingent queue area? It's difficult to know exactly. This depends on number of factors including our position in the parade and potential delays with the contingents that are marching before us. It could be 2-3 hours or more. Restrooms will be available nearby while we are waiting. There are also eateries within walking distance. What can I expect during the parade? We will have a variety of signs (both large and small) available for intactivists to carry down Market Street. We will also have stickers, bracelets, and leaflets available for intactivists to hand out to the parade spectators. Please watch this video to get an idea of what to expect. 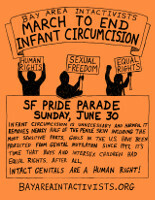 Yes, any messages against infant circumcision, forced genital cutting, or genital mutilation are welcome. Signs promoting genital autonomy or the human right to genital integrity are also great. The decision whether or not to use graphic images or strong language is up to you. Per San Francisco Pride Parade rules, signs in our contingent cannot advertise businesses or organizations other than Bay Area Intactivists. Please keep in mind that Market Street is extremely wide so be sure that the lettering on your signs is large and bold enough for it to be legible from a distance of at least 30 feet. Where do we assemble before the parade? We will assemble on Beale between Howard & Folsom. Our contingent line-up number is 217. Click here to see a map. Intactivists will begin to assemble at 9:30 am. Please arrive no later than 11:30 am if you plan to march. Driving and parking in San Francisco can be very challenging during San Francisco Pride. We recommend taking public transit. If you are travelling from outside San Francisco, we recommend taking BART. There are several BART stations outside San Francisco where you can park your car. The Embarcadero BART station is closest to where we will assemble before the parade. The Civic Center BART station is closest to where the parade ends as well as our San Francisco Pride booth. If you are traveling from within San Francisco, we recommend taking the MUNI Metro. The Embarcadero MUNI Metro station is closest to where we will assemble before the parade. The Civic Center MUNI Metro station is closest to where the parade ends as well as our San Francisco Pride booth. What other Bay Area Intactivists events are taking place during San Francisco Pride? Where do I ask my question that isn't covered here? Please contact eve...@bayareaintactivists.org for additional information.